However, it is sobering, and perhaps not a little disturbing, to realize that many of the fiercest struggles and greatest battles are with the Valiant One, with the Lord God Himself. Abraham is assaulted with God’s demand to sacrifice Isaac. Job is afflicted in body, soul, spirit, and heart. He asks a simple “Why?” and must, himself, be questioned by the Lord God. Jacob wrestles with God in order to receive a Word of blessing. Hear again what St. Matthew records of that day: Then Jesus went out from there and departed to the region of Tyre and Sidon. And behold, a woman of Canaan came from that region and cried out to Him, saying, “Have mercy on me, O Lord, Son of David! My daughter is severely demon-possessed.” But He answered her not a word. And His disciples came and urged Him, saying, “Send her away, for she cries out after us.” But He answered and said, “I was not sent except to the lost sheep of the house of Israel.” Then she came and worshiped Him, saying, “Lord, help me!” But He answered and said, “It is not good to take the children’s bread and throw it to the little dogs.” And she said, “Yes, Lord, yet even the little dogs eat the crumbs which fall from their masters’ table.” Then Jesus answered and said to her, “O woman, great is your faith! Let it be to you as you desire.” And her daughter was healed from that very hour. My dear friends in Christ, the Canaanite woman’s daughter was demon-possessed. Neither you nor I nor anyone I have ever met, had the awful situation and the horrible circumstances of this poor Canaanite woman. The woman herself and the events of her life are so miserable that it is hard to imagine things being worse. First of all, she is a woman. In that time and culture, being a woman often meant being in a lower class and having a lower status. Second, she is a Canaanite woman. With respect to Jesus, she is a Gentile and He is a Jew. That means she is not one of the children of Abraham and not one of God’s chosen people of Israel. She is an outsider with absolutely no genetic right to ask for help. Third, the woman’s daughter is demon-possessed. Moms and dads stay up at night with a sick child a parent’s heart aches when a child is sick with a serious disease for a long time. I simply can not even imagine the awful anguish and plaguing pain a father or mother might have if a little daughter is demon-possessed; where Satan bodily invades a child. The thought is completely frightening. When you stop and think about what has been said to this point, how the greatest struggles are with God, and how that truth applies to the Canaanite woman, you really begin to wonder just how she could endure it all. The struggles with God are so great because they are so unexpected. I mean I really do expect to battle against this old sinful nature that clings to me. I truly expect the world to be against me and place temptations in front of me. I recognize that I must be aware that the devil is roaming around like a roaring lion seeking someone to devour. But with all that facing me, I was thinking that I had enough to contend with, that I wouldn’t have to wrestle with God. The Canaanite woman closes her eyes to the fact that she is a Gentile and closes her mind to her pagan nationality. By faith, she trusts that the Lord will hear her; a plea, not for herself, but on behalf of her daughter and by faith, she trusts He would grant it. And so, seeing Jesus, the Canaanite woman took that sliver of hope which was based upon a mere crumb of the Word and petitioned God with the title the Hebrew people used, “Have mercy on me, O Lord, Son of David! My daughter is severely demon-possessed.” And in response to her plea, she hears silence. Dear brothers and sisters in Christ; when we pray, we beg the Lord to be who He is. He says, “I am merciful and gracious, longsuffering, and abounding in goodness and truth, keeping mercy for thousands, forgiving iniquity and transgression and sin” (Ex 34.6-7)—that is not a job description, that does not describe some of the many things the Lord does. No. Merciful, gracious, slow to anger, abounding in mercy, forgiving; these tell us exactly who this Lord, this Son of David is. “I know that You are a gracious and merciful God, slow to anger and abundant in loving kindness, One who relents from doing harm. I know that you are ready to pardon, and do not forsake those who call on you in faith” (Jon 4.2; Ne 9.17). But what good does that do when the Lord turns a deaf ear? When you’re sure He’s working against you? When it feels as if He’s left you to deal with things yourself? When every prayer, every pious act, every religious pursuit, every ounce of faith and believing—when nothing seems to work or make things better? What good do all the Lord’s promises do—and all this talk about His mercy—when the only thing you hear from His mouth is what you already know—that you’ve done wrong, that you’re a sinner who deserves everything you’re going through? Now you know the frustration and angst that is bone-deep. Now you can begin to understand the depth of the Canaanite woman’s pain for her daughter. 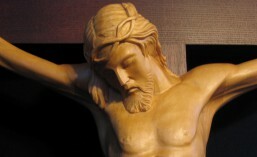 Now you know the silence into which Jesus cried out, “My God, My God, why have you forsaken Me. Why are You so far from helping me, and from the words of my groaning?” And now you feel the crushing blow of the hammer of the Lord’s Word, the breaking and hindering that is also the Lord and His will. Why does Our Lord speak this way? Why does He seem not to care? Why doesn’t He just come right out and say what He means, and make things better, and do it now? Because He is strengthening your faith. He is drawing out from you the confidence, the confession, the courage, and the conviction that relies on Jesus only. And He’s slowly, gently, carefully, lovingly, pulling you up. The Canaanite woman saw that. That’s why she refuses to hear the “no” that you thought Jesus said. Instead, this woman latches onto the loop-hole, the way out, the “perhaps” and “I will” that is hidden both in Jesus’ words and in His person—for she believes that Jesus must be who He is—and she will not let Him be anyone else. What is so great about this woman’s faith? Not that she somehow finally comes up with the right combination of words, but that she holds Jesus to *His* Word. Not that she grovels and begs and demonstrates who she is, but that she insists that Jesus be *who He is*. And not that she refuses to give up, but that she refuses to believe that the Lord’s “no” is stronger than His “yes,”—she trusts that His loving mercy overrules His righteous judgment. In this way, the Canaanite woman is like a child. She will not give in until she gets the answer she knows Jesus will give. She will not give in until she wears Him down to receive the mercy she knows the Lord has. She’ll do whatever she must to get the Jesus she knows and believes is there for her. You get the Jesus you hope for. And so this woman did. And so do all those who cry out to Jesus for help. This entry was posted in Sermon and tagged Matthew 15. Bookmark the permalink.